The gentleman who owned our house before my husband and I left this desk (i.e., escritoire. I love that word. With its French origin, it playfully rolls off the tongue) out on the curb one day. He allowed us to stop by briefly for measurements prior to our closing and when I saw the desk, I somehow convinced him that he needed to store it for me in our soon-to-be-new-home even though he was still living there. In retrospect, I feel slightly bad about my blatant disregard for his space. Oops. The desk was substantial and in decent shape, had nice storage and great potential, but most of all, it was FREE! “Curbside freebies” are the best kind of furniture to work on. Because you find it on a curb, there is a near zero chance that the person will be in your home wondering what you have done to their mother’s precious desk, nightstand, china cabinet, etc. And most importantly, I feel it gives me full license to experiment with the piece because what is the worst that can happen? There is no monetary investment aside from the products and tools used to transform the piece. Admittedly, this desk has been in the works for some time now and has gone through several transformations. But in the end it was all worth it because I learned a lot. 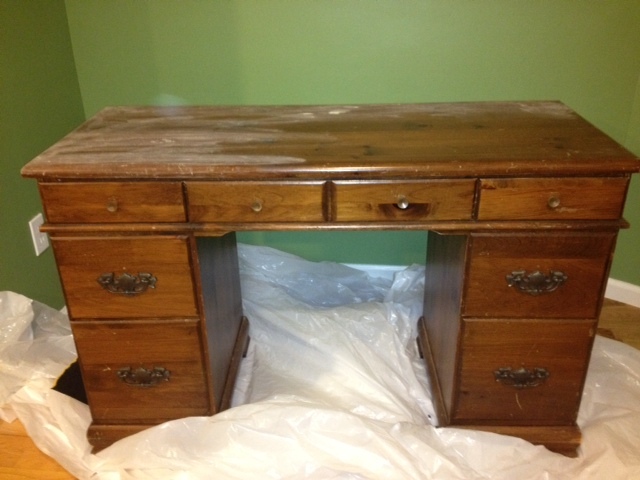 First, I gave the whole desk a light sand to remove the old varnish. Next, I used wood putty to fill stress gaps around the base of the desk and in some of the joints. Once the putty dried, I lightly sanded the areas to make ensure a smooth finish. Still not satisfied with the look (some of the gaps were quite large), I repeated this process one more time. The top of the desk had some divots and other signs of wear and tear but instead of power sanding it smooth, I used a screwdriver and a steel wood pad to scratch it up and ding it a bit more. Next, I primed the whole desk with Kilz primer. I didn’t use the shellac version in this case because I wasn’t concerned about some of the knots and other discolorations showing through. Next I layered charcoal, smoky grey, and antique white paints and then sanded it (I alternated between different grits of sandpaper) to get the finish I wanted. In spots where the bare wood was showing through, I used wood stain (shade: Kona). I used a small painter’s brush to apply the stain on the bare wood and then wiped it away quickly with a cloth to achieve the look I desired. 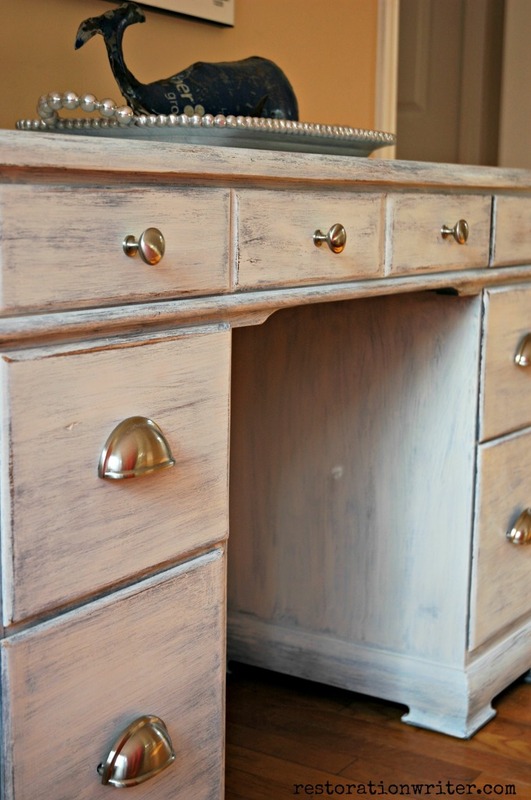 I am so pleased with how this piece turned out that I can’t wait to get my hands on another escritoire! es·cri·toire (noun): A writing table; a desk. Ouch…I have given away lots of furniture that deserved another life. Wish I had your talent and initiative. This looks great! Previous story O Driftwood Tree, O Driftwood Tree!